It’s not very often I find fabric in my local Fabricland that I totally fall in love with, but this was one. It’s a brown-white crosshatch cotton-poly-elastene lightweight denim that I circled around for weeks until it went on clearance, and then I bought the entire bolt for $5/metre. I can’t remember exactly how many metres I purchased, but I knew it would give me several pieces, none of which I planned to wear together, but would provide a nice collection for other pieces. The first piece in this collection was a skirt, sewn last summer. I’ve made four of these, in lime green, black, khaki, and now, brown. I don’t have pictures of the black one, but it’s made from the same beautiful cotton denim as these jeans. I don’t have any photos of my wearing it, so this will just have to suffice. I’ve worn it a lot over the last couple of summers. Then I wanted some capris, and decided to try Burda 04/2010 #143. These were an experiment in Burda’s plus sizing/drafting, and I’m surprised at how much I like to wear them. They have more wearing ease than a typical stretch denim pant pattern, as they’re drafted for non-stretch fabrics. I made a curved waistband, not the elastic one as in the pattern. I love the little tab details on these. The front tab is like a little built-in belt, and the hemline tabs are fun. These have been in constant rotation through my wardrobe since last summer. I did make up a jacket in this fabric, but didn’t like it much, so I gave it away. 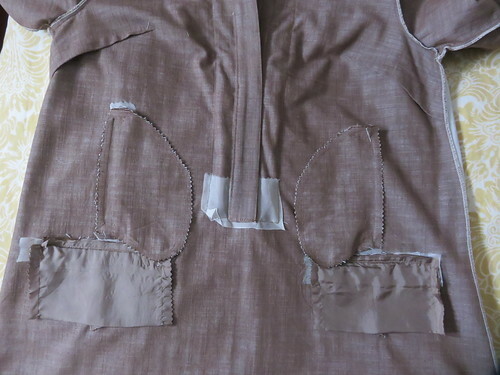 It was my mistake in shortening the back waist and grading it into the side front that caused the fail (I did do a pattern fitting session on my dress form… in my defense… It was the execution that was subpar…) and in the end I just didn’t like the fabric enough in a casual safari-style jacket. Whe n I purchased this massive length of goods, I initially thought of doing a safari style set of garments. 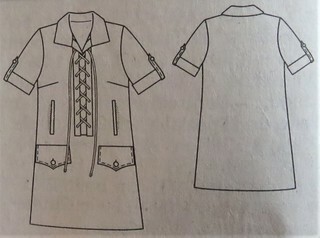 This dress is probably the only things that would actually qualify as having typical safari elements: big patch pockets, lacing, buttoned tabs, etc. The pattern is Burda 5/2010 #112. I only have a German copy of the magazine, so it was a bit fun translating a word here or there in order to get the gist of Burda’s construction suggestions. Between reading the instructions aloud (my ear can hear hints of English sometimes) and studying the magazine photo, I managed to put it together without pulling my hair out. I underlined the back of the dress with a cotton batiste. The front interior is a bit messier than I like with all the pockets (total of four) and the laced opening. See? Mess on the inside. This is a construction pic, and, no, you’re not looking at it upside down. I’m in the process of doing the welt pockets with the flaps in this photo. That fabric was obviously waiting for you to buy it all, what a good score! The capris and dress are both look lovely on you. 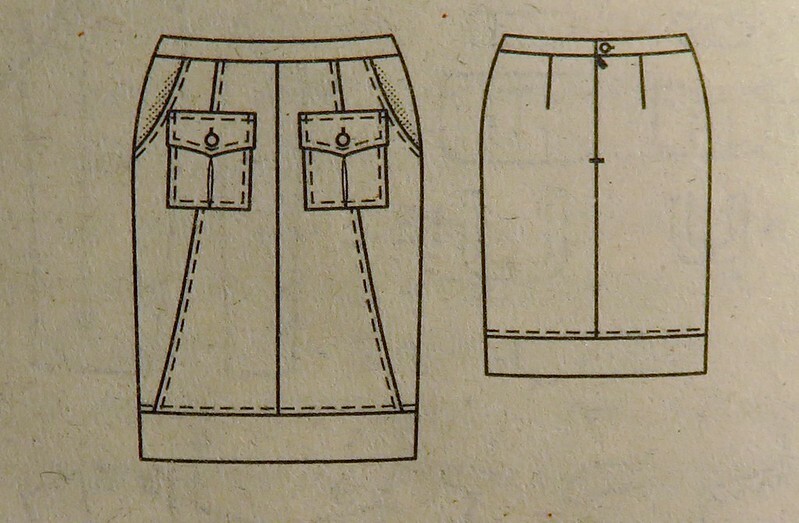 That skirt pattern looks nice and interesting too! All looking good – and the inside isn’t as bad as you think! As has been pointed out no-one else sees the inside so just say nothing and accept the compliments 😃. Well done bagging the roll at sale price! That’ll make for easy packing! What a bargain you bagged and have made some lovely clothes. You dress looks immaculate on the outside. I like them all! So many lovely garments at such a good price! I love the laces on the dress – reminds me of a dress I had a few years ago, stylish but comfortable! I’m glad you made this safari dress. I made it many years ago and blogged about it. It’s still one of my favourite made and I’ve always intended to make another version in linen. By the way I would like your input concerning the sleeve width, I remember they felt pretty snug for me. I remember your dress. It was the inspiration for tracking down the pattern and making one for myself. My thoughts on the sleeves: I think they’re snug because of all the length gathered up abve the elbow. I haven’t worn mine much, but I remember wondering if cutting them down to 3/4 length would eliminate some of the bulk and provide more ease. Had to comment on your messy insides … vintage haute couture gowns were always very basic on the inside and often quite messy too so you are in very good company. When did we have to start worrying about what no-one else can see? 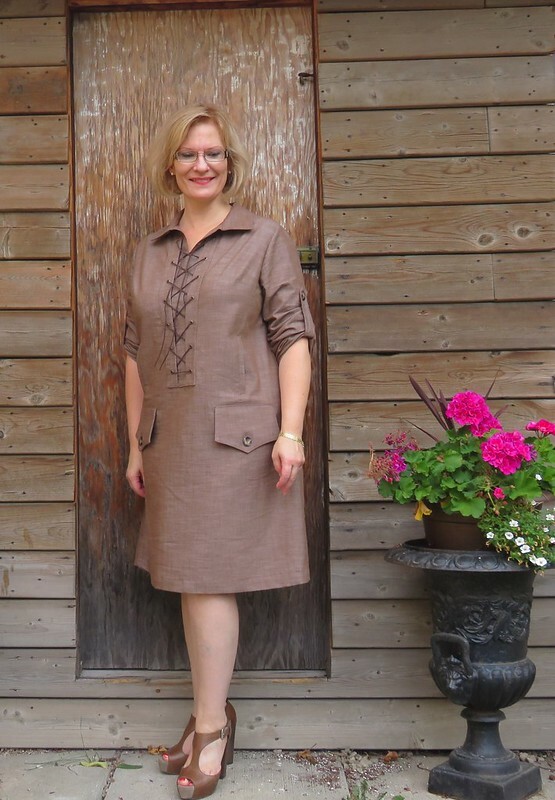 All these garments are very flattering on you and I really enjoy seeing some old Burda WOF patterns reviewed. It inspires me to break out my back catalogue. Thank you for reminding me of the messy insides of vintage garments. Even some modern couture garments take me by surprise when I am afforded a view of the interior by their lack of pretty finish. Wonderful dress! Looks perfect for summer. Oh my but that dress is stunning! And I vote no darts it’s perfect as is. BTW, I love that you bought the entire bolt when it went on sale. A woman after my own heart! Love the looks and the colour on you. Most of all I love everything about buying a whole bolt of fabric!! 🙂 I think I am going to make a pair of those pants for myself and I am sorely tempted by the dress. WOW.. Looks great and like a lot of work! 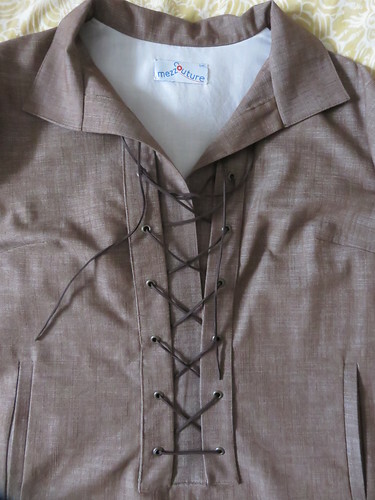 From tracing the pattern to translating the language and then sewing it up- the lacing and dress look great! Ooh, thanks for reviewing your safari dress, it didnt disappoint! I hadnt realized that there are pockets above the flaps as well. My welts still come out a bit wonky at the corners so i might keep only the bottom set of pockets for the flap insurance. And i agree with the casual rolled sleeves, more non-chalant. One question if i may, why underline only the back? Is it because the front had too much going on so best avoid underlining there or were you really only worried about the back (and if the latter, worried about what, that it would stretch out from sitting, perhaps?)? Anyway, lovely dress, clearly a go-to in hot weather, great choice! I underlined it with batiste, and thought it would make sitting in hot weather a bit more comfortable – no sticking to my legs as I stand up – and prevent the back from bagging out of shape, something this fabric does. 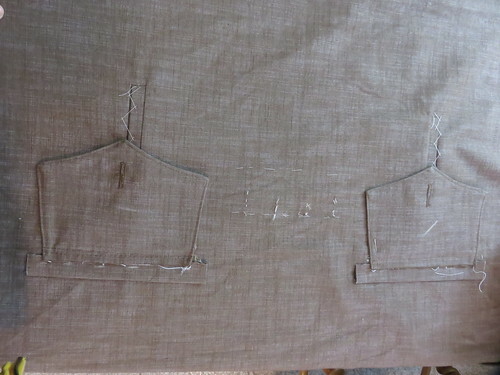 In a perfect world, I would have made this from linen and underlined it with voile or silk organza, but I thought the voile was a good underlining choice for this fabric.